Like an actor coveting a script, the designer’s relationship to information is also an intimate one, focused to the point of wrestling. The “content” is the source material, open to interpretation. Scott—in his soft-spoken, even reverential tone—expressed a sincere sense of wonder. He adopts the artist’s point of view and co-opts it from a designer’s point of view, without dismissing the artist’s original perspective or body of work as a mere collection of footage. Scott repeated his and his team’s practice of preserving the artist’s intent, not obscuring it—dubbed “overstepping.” Jason Fried, who co-founded Chicago-based webapp maker 37signals and spoke at the second Chicago CreativeMornings, highly favors design that gets out of the user’s way. As iA’s Oliver Reichenstein leanly put it, “Good design is invisible.” Design realized as intervention, not interference. At first, I reacted to this statement as being counterintuitive. But I reneged. Every design decision begets more design decisions—zooming in, out, and back again, then returning to clockwise motion. Scott was referring to book design, especially the exhibition catalogues of artists that are artistic objects themselves. Such efforts exemplify the trifecta demanded by book design: typography, materials, and production methods. And the results are a testament to hard work, reciprocated with honesty. Scott and his team’s attention to detail, whether they be tactile or not, remind me of the process and its commanding pace undertaken by Jay Ryan, who owns and runs screen printing studio The Bird Machine. 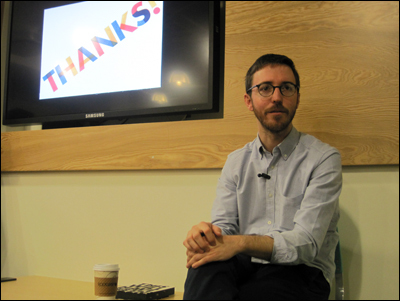 At the fifth Chicago CreativeMornings, Jay revealed his steps toward achieving an ideal, marked by patience and exercised with maniacal enthusiasm. Big thanks: to Digital consultancy Acquity Group for hosting Chicago CreativeMornings #13; to organizer Mig Reyes, videographers Chris Gallevo and Erick De La Rosa, for their great work on making CreativeMornings happen in Chicago. Typeface of quotes is called Massive designed by Shawn Hazen, who also makes wonderfully bold typographic illustrations for Design Feast series Creative Roles. My coverage: view more photos of 13th CreativeMornings in Chicago; read more write-ups about Chicago CreativeMornings. 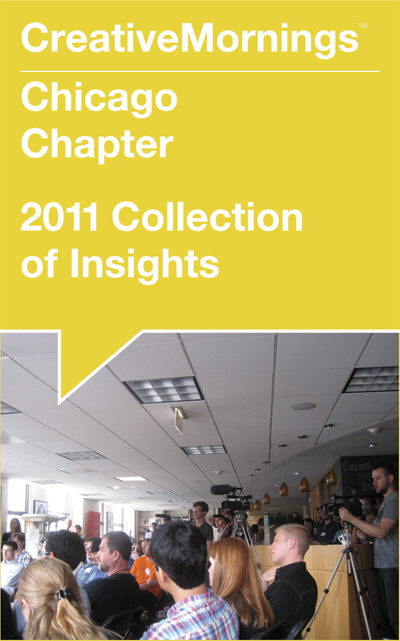 2011 was Chicago CreativeMornings’ excellent debut year. Download a collection of insights.